Biomass Energy Systems, Inc. (BESI), a woman-owned engineering company that provides innovative technology for alternative and renewable energy projects, announced the completion of a turnkey, two-ton per day waste-to-energy research facility at its University Park, IL location. The research facility, funded by the United States military, features waste to energy (WTE) through gasification, and features the patented TURNW2E® Gasification System. A distinguishing factor of this unit, is that it has the capability to produce different types of final energy output types, including steam, hot water and air conditioning, in addition to electricity. “The pilot facility represents a unique opportunity for the military to experiment with a variety of applications for the TURNW2E® core, integrated with specially designed equipment to use specific waste types and produce specific power outputs, and at a scale comparable to what an installation at a base or forward operating position might be,” commented Ms. Renee Comly, President and CEO of BESI. Comly added that the full scale WTE research and development facility is now open for evaluation for not only military, but also for visitors interested in municipal and commercial evaluation. The BESI system offers advantages beyond its ability to dispose of wastes such as wood, biomass, packaging, paper, plastics, cardboard, yard, and demolition debris, all of which are processed and converted efficiently by the system. 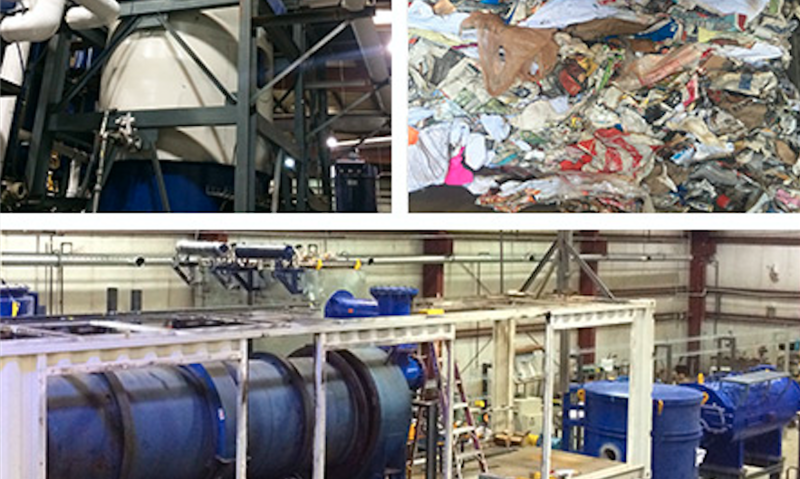 The system also handles traditionally difficult to dispose of wastes such as tires, dewatered sewage sludge green waste and oils, in addition to a variety of facility maintenance wastes including rags, gloves, apparels, used engines filters, organic solvents, paints, and other nonhazardous chemicals. Liquid waste remediation is a specific area of interest for the TURNW2E® system, which has a facility accomplishing this overseas, with plans for many more. By enabling different forms of energy to be evaluated and produced at the research facility, all branches of the military can evaluate how to best implement WTE on their respective bases. The facility is modular by design, with all of the key components skid-mounted to facilitate a variety of waste scenarios and energy output types. And, the TURNW2E® system in University Park is large enough to replicate real world scenarios and base requirements in terms of both waste consumption and resulting energy production. The new pilot facility is the culmination of several successful TURNW2E® demonstrations and installations that BESI has completed for the US military. A full scale, 100TPD commercial facility in Korea, followed by the trial installation of a BESI-designed TURNW2E® system, located in Wilmington, IL, initially validated the military use concept. Then, a larger scale subsequent installation at Joint Base Pearl Harbor-Hickam on the campus of the Hawaii Air National Guard demonstrated the efficacy of converting 10 tons of waste to energy per day. The University Park, IL pilot installation will provide the US military with an even more comprehensive evaluation of ongoing real applications of the TURNW2E® driven system. BESI’s methodical approach to prove it has the fundamental ability to make the technology reliable and sustainable is resonating with both military and government leaders, as with each trial, they come one step closer to making W2E gasification technology a military reality to support strategic waste reduction goals. The demonstrations to date have already opened up dialogue with different military branches, as they realize potential applications. For example, Navy ports could potentially utilize a WTE system to provide cold ironing – shore side electrical power to a ship at berth – using the same waste coming off a ship upon arrival, for a true zero net waste solution. BESI is also in discussions with regional universities to use the research facility as the basis for developing education programs for military and civilian engineers, as well as hands-on training. Since its origins, the company has worked closely with numerous universities on educational and training programs for alternative energy usage and production.